Whether you’re after a rare vintage Scotch, the finest of world malts or an eye-popping indie bottling, Hong Kong has many must-visit whisky bars. Martin Eber reports. When you think of destinations exhibiting ‘whisky weather’, Hong Kong is unlikely to spring to mind. With its long, hot and intensely humid summer, you’d be forgiven for thinking that whisky might not rate highly as a local drink of choice. The past few years, however, have seen something of a whisky boom in Hong Kong, with masterclasses, clubs, festivals, auctions and visiting whisky personalities all becoming regular features. With this, of course, come proper whisky bars, and in just a few short years Hong Kong has seen their numbers expand well into double figures, many of which are ‘hidden’ – not in an attempted nod to Prohibition-era speakeasies, but due to sheer practicality. With commercial properties renting for sums as high as the skyscrapers in which they reside, bars often look up (or down) to find alternate spaces – slightly more obscured perhaps, but no less alluring. Here are six such bars, dotted all around Hong Kong – each offering whisky fans and newcomers something slightly different. Located on the 10th floor of a tiny, nondescript commercial building in the heart of Lan Kwai Fong (LKF) in Central, Club Qing is a world away from the busy, bustling booze dens below. The focus here is twofold – Japanese whisky and vintage Scotch. With a complete set of Ichiro’s Malt Cards (54 bottles) proudly on display (and several available by the dram), accompanied by a constantly-rotating selection of rare vintage drams (think Macallan, Bowmore, Laphroaig and Lagavulin bottlings from the 1970s and 1980s), it’s likely you’ll find a dram here you won’t find anywhere else in Asia (except perhaps at Singapore’s Auld Alliance, or Japan’s Mash Tun – the people behind all three are good friends). With a warm, welcoming atmosphere, knowledgeable staff and one of Hong Kong’s most impressive selections (including the bar’s own series of bottlings, featuring a 40-year-old ex-fino Speysider), it’s the sort of establishment you can return to again and again, each time discovering something new. In a relatively short space of time, Ginger (like Club Qing) has managed to firmly establish itself as a favourite among Hong Kong’s whisky crowd. Located in Sheung Wan on Hong Kong Island, five minutes from Central by taxi, the bar is relatively obscured by its rendered concrete front, hidden sliding door and laneway location (hint: look for the lamp emblazoned with ‘Ginger’ at the front). Ginger’s owners frequently travel to distilleries and international whisky shows, bringing back knowledge (and whisky) to share with their customers, and it shows in their collection of more than 400 single malts (with new bottles arriving almost daily). 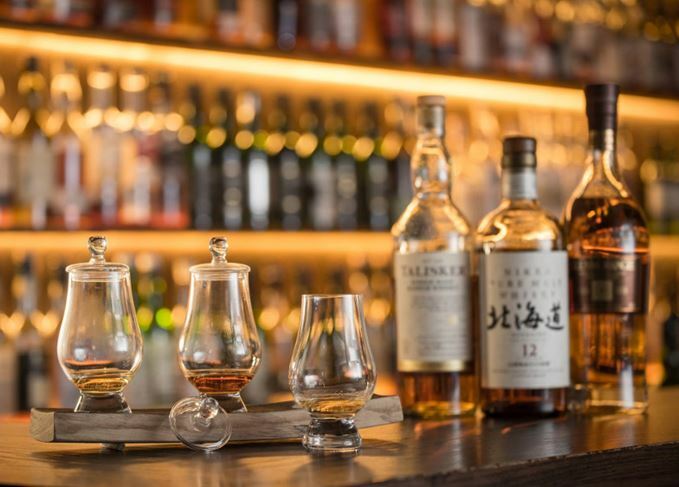 The bar carries a well-thought-out mix of Scotch, Japanese and New World whiskies, both original and independent bottlings, and often features new whiskies well before their release dates in Hong Kong. As Hong Kong’s first Ardbeg Embassy, it’s also a good option for Islay fans. If the name wasn’t already a giveaway, the full-size cask and glass valinch which greet customers as they enter surely indicate the bar’s intentions. Despite being located in the heart of Central, just seconds from the famous ‘escalator’ that snakes its way through the city, you could easily walk right past Angel’s Share and not realise. Located on the second floor of an otherwise unremarkable building, a small sign at street level is your only hint. Despite being one of Hong Kong’s first dedicated whisky bars, Angel’s Share still more than holds its own, with a sizeable list of Scotch and Japanese, and a smaller list of Irish, Taiwanese, American, Canadian, French and Indian whiskies. That cask isn’t just for show either, with a rotating selection of drams available to order directly from it (at the time of writing, it contained Kavalan Solist Sherry cask, but in the past has also held Macallan and The Glenlivet). The surroundings might not immediately scream ‘whisky bar’ (polished metal walls, exposed concrete and coloured LED lighting), but the collection of whiskies, which numbers well over 700, certainly does. In addition to being a Scotch Malt Whisky Society (SMWS) partner bar, SAFE carries a range of independent bottlings (including Samaroli, Sansibar and Spirits Shop Selection) and original bottlings from Suntory, Edrington, and all the major Scotch distilleries you’d expect. The real draw though is the whisky library to your left as you walk in. With some of the rarest whiskies in Hong Kong (including row upon row of single cask Yamazaki, Karuizawa, countless vintage Macallans and even an Ichiro’s Joker Monochrome), it’s no wonder the bar is hidden behind a gigantic metal safe door. Also located in Sheung Wan, SAFE is only a short walk from Ginger. For the last two bars on this list, we head over to the Kowloon side of Hong Kong, specifically Tsim Sha Tsui (TST) – a short train or ferry ride from Central. Bar Butler is probably the most well-known whisky bar in this part of town (and with good reason), but located two floors above, on the seventh floor of the same small commercial building, is Bar Buonasera, an offshoot of the Osaka bar by the same name. As you might expect with a Japanese-style bar, the atmosphere is quiet, welcoming and with excellent hospitality (and cocktails). The whisky selection might not be as large as some of the others on this list, but it is well-curated, and often includes whiskies that aren’t available by the dram anywhere else in Hong Kong (especially rare Japanese releases). Located in the depths of the Intercontinental Grand Stanford Hotel (a short walk from Bar Buonasera), Tiffany’s is a bar with old-school charm but a modern appreciation for whisky. Not content with having a sizeable selection of whisky, hosting regular masterclasses and holding Hong Kong’s biggest annual whisky festival, Tiffany’s also pushes the whisky envelope with experiments including whisky ice cream, whisky mooncakes (a whisky version of the popular Chinese delicacy), and its own in-bar maturation programme, where popular whiskies are given additional finishes in small casks right on the back bar.